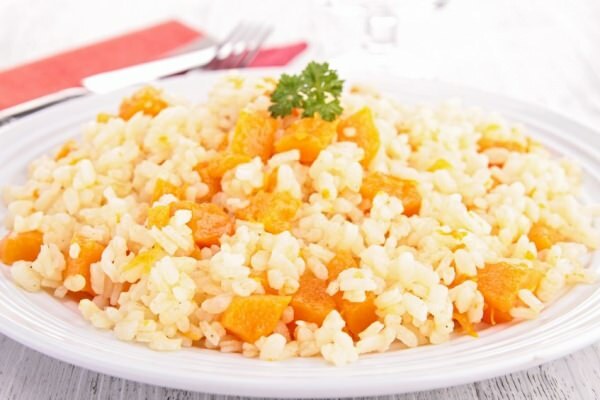 Pumpkin risotto is a quick and simple recipe to follow that’s totally delicious. Most of us love risotto and have been making a host of different variations for many years. Pumpkin risotto is ideal for your Thanksgiving or Christmas dinner and for usual family dinner as well. If you watch your calorie intake, opt for brown or black rice instead of white one. Cut the squash in half. Bake one half in the oven. Once it’s ready, make puree. Peel the other half, cut into small pieces, and saute in a little butter until soft and tender. In a saucepan, heat olive oil, add garlic and onion and saute for 3 minutes or until soft. Add arborio rice and stir until the rice is coated with olive oil. Add white wine and cook until it’s been absorbed. Add 3 cups vegetable/chicken stock to cover the rice. Cook all of the liquid is absorbed. Pour in another cup of the stock, cook until it’s been fully absorbed, and add 2 more cups of the stock and cook, stirring, until most of the stock has been absorbed and your rice is al dente. Add the diced pumpkin and pumpkin puree to your rice. Lower the heat. Stir in butter and grated Parmesan(optional) and serve.